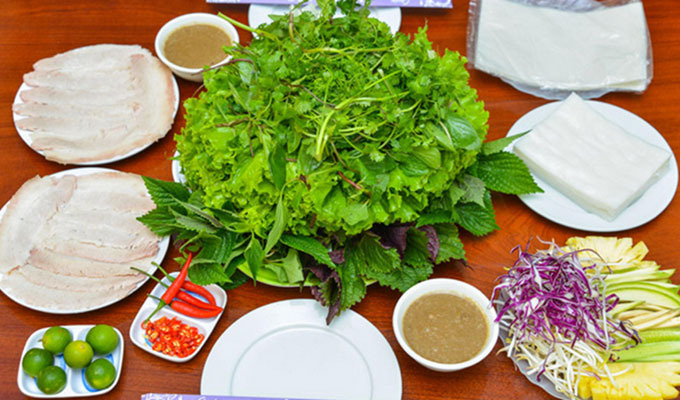 Pork summer roll is a specialty of Da Nang that satisfies even the most demanding gourmet. Made from common meat such as pork, this dish has gained a universal reputation in Da Nang and many other regions in Viet Nam. Il prossimo, the vegetables are prepared. They include cucumbers, perillas, lattuga, green bananas and other kinds of fresh veggies. One can either choose the wrapped rolls or enjoy wrapping their own pork summer roll.